I’m sitting here trying and failing to think of a cooler desk ornament than a bona-fide velociraptor claw. I mean sure, you could have a Newton’s cradle, but that doesn’t subtly hint in quite the same way that you might just have a trained dinosaur waiting to wreak havoc under your desk. The claw is a fossil dating back to the Cretaceous period, found in Mongolia, and on sale at the Astro Gallery of Gems in New York. Most surprisingly, it only costs $12,500, which seems like a small price to beat every other piece of Jurassic Park memorabilia ever. Sure, $12,500 would buy you a decent used car or a month’s rent on a broom closet in San Francisco, but those are the purchases of a lesser person, with boring, adult, non-velociraptor-filled dreams. Reclaim the excitement of your childhood; buy a velociraptor claw today. 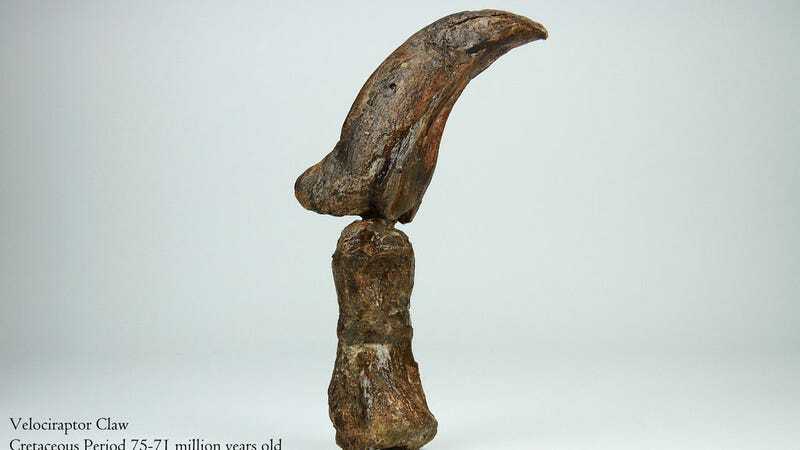 Please, for the love of god, somebody buy this velociraptor claw before I check my credit limit.